The Evektor sponsor’s message was “goodbye,” and thus the EV-55 Outback twin departs these pages, having had its development suspended on March 16. Banished, too, is the Diamond DA50, which has lost itself in a maze of engine changes that never quite seem to suit. Rapid introduction, certification and delivery of the Daher TBM 910 in March and April leaves no trace here. Debuts comprise an Alice determined to prove that electric-powered business aviation is not in the realm of Wonderland; and yet another stillborn Western program, the Orka, seized upon by enthusiastic Chinese entrepreneurs. New Type Certificate (TC) holder Aircraft Integrated Solutions Ltd is managing the return to market of the Ibis Aerospace Ae 270 Spirit on behalf of COPS investment house of Lebanon. Originally, the project was abandoned in 2007, after three prototypes and three production-conforming examples had flown in the Czech Republic, and EASA certification obtained. Appropriately for a company seeking to raise the dead, AIS headquarters is in the exclusive medical district of Harley Street, London. A P&WC PT6A-66A turboprop flat-rated at 850 shp raises two crew and either eight passengers or 2,645 lb. of freight loaded through the 4 ft., 1 in.-wide cargo door. NBAA IFR range is 1,420 nm. Price and proposed manufacturing location are still to be announced, AIS having said nothing new since September 2016, when OEM, Aero Vodochody was subcontracted to provide TC-related support. Although it displayed its five-seat turboprop at the Zhuhai show last November, CAIGA managed not to explain why this factory-built version of the U.S. Epic Escape is making such painfully slow progress. Powered by an 850-shp General Electric H85 turboprop, the Chinese prototype made its “official” first flight in July 2014, but did not follow up with a wheels-retracted sortie until November 2015. A static test airframe passed its trials in May 2016, clearing the way for two more pre-production aircraft, whose appearance has still to be confirmed. Range is 1,350 nm and cruising speed, 324 kt. The original $1.5 million price tag is, probably, out of date by now. Will it, or won’t it, be at next year’s NBAA Convention? First flight is set for the third quarter of 2018, to be followed in 2019 by certification to FAR Part 23 (single pilot), and production at Wichita, on the former Caravan line. A single, all-new, 1,240 shp General Electric GE93 turboprop makes the $4.5 million Denali good for a 1,100-lb. full-fuel payload, 285 kt. maximum speed and 1,600-nm range with five-up. The pressurized cabin, 5 ft., 10 in. high and 16 ft., 9 in. long, has seating for a typical six passengers and two pilots, the latter with Garmin G3000 avionics, weather radar and today’s other standard aids. To lure customers away from the Pilatus PC-12, Daher TBM 910/930 and Piper M600, a 4 ft., 5 in.-wide freight door is standard. Although rollout of the first production Seastar took place at Oberpfaffenhofen, Germany, on August 18, don’t hold your breath. Not until the first half of 2019 will it take to the air, revalidating its 1990 Type Certificate the following year, by reason of a revised Honeywell Primus Epic 2.0 cockpit, new five-blade MT propellers, new landing gear from Sumitomo, a water-maneuvering thruster and other upgrades. The Dornier family’s 1980s company was reborn in 2015 with the assistance of Chinese money, having previously built only two prototypes of the 12-seat, push-pull (PT6A) turboprop in its previous incarnations. Now employing composite parts supplied by Diamond Canada, the amphibian sells for $7.5 million, cruises at 180 kt. and has a range of 900 nm. Currently running two years behind schedule, Epic now expects to secure 2018 certification for its production version of the Epic LT factory-assist kitbuilt, thanks to the imminent first flight of its second, production-conforming prototype. Russian-owned, Oregon-based Epic flew its first E1000 in December 2015, that aircraft now having accumulated some 400 hours, exclusive of the time on 54 now-discontinued kitplanes. Despite the loss of some Russian orders, Epic has 76 mostly-U.S. customers lined up for its $3.25 million, PT6A-67-powered offering – some transitioning from Phenom 100 jets or the larger PC-12 turboprop. Operators get pressurization, a three-screen Garmin G1000NXi EFIS,1,650-nm range with 1,100-lb. payload and 325 kt. cruising. Founded in Israel two years ago, Eviation Aircraft is building a prototype powered by three electric-driven propellers, at the wingtips and in rear fuselage. Two same-size versions, both fly-by-wire, are envisaged: Alice for air taxi operations, certified to Part 23, IFR, capable of flight into known icing with power from an all-lithium-ion battery; and the extended-range Alice ER, having a more powerful Aluminum-Air system with lithium-polymer buffer. The latter, intended for low-cost executive transport market, has a pressurized cabin (4,000 ft. at FL 280) and should be available by 2023 at a cost of $2.9 million. Constructed mainly (95%) of composites, Alice ER has G5000 avionics, 738-nm range and a cruising speed of 270 kt. The baseline Alice is scheduled to fly in early 2019. A production license for the former Iowa-based King’s Angel 44 pusher twin-prop was acquired in 2013 by Hubei Taihang Xinghe Aircraft Manufacturing of China. In May 2016, the Hubei local government provided funds to establish a manufacturing plant. Originally, The King’s Engineering Fellowship managed to place only four aircraft between its 1984 first flight and 2008. Two 300-hp Lycoming IO-540s propel this six-seat STOL machine at 169 kt. on 65% power, covering 1,248 nm at the same setting, or 1,720 nm on full economy. The first Chinese example was substantially complete more than a year ago, but nothing further has been heard. A second Traveller prototype was completed late this year, joining the aircraft that first flew in July 2016 from a new, purpose-built factory at Capua, Italy. The launch order was augmented at Aero ’17, Friedrichshafen, Germany, in April by announcement of six customers in Argentina, the South Pacific region and Russia. More significantly, on September 21, Cape Air, the U.S.-based commuter airline, firmed up on a delivery schedule for the first 20 of the 100 it plans to acquire. EASA and FAA certification is due in time for first deliveries in January 2019. Although pure-freight and six-person executive versions are among the options, first Travellers off the line will replace aging Part 23 workhorses, such as the Piper PA-31 and Cessna 400-series twins, at $2.2 million per copy. Traveller is a rugged, 10-passenger transport with high, cantilever wing and fixed landing gear, powered by a pair of 350-hp Lycoming TEO-540-A1A flat-sixes that can run on Avgas or Mogas. It will cruise at 180 kt. for 450 nm with full passenger load, or 720 nm with eight aboard. China’s dogged quest for certified but un-utilized Western aircraft to build continued in February when Tongzhou General Aircraft Manufacturing of Nantong, Jiangsu Province, announced the launch of a major infrastructure project at Xingdong aerodrome for manufacture of the Polish-designed M&M EM-11C Orka, the initial completion due in the first half of 2018. The attractive Orka, a four-seat utility twin-prop, flew in 2003, and only five prototypes were built up to the time EASA day VFR certification was obtained in April 2011 – and then shelved. The ‘C’ version has 160-hp Lycoming IO/LIO-320s driving MTV-12 counter-rotating propellers, 141 kt. maximum speed and a range of 918 nm, plus 45 minutes. After a low-key but well-received toe-in-the-water showing at Paris this past June, XTI is set for a more spectacular debut in its homeland, with a one-third model displayed at its Las Vegas booth this week. Possibly also to be revealed is the identity of the customer whose order for three was announced in June. A two-thirds-scale prototype of the innovative VTOL, six-seat TriFan was to have flown in about a year, but XTI is now going full-size from the outset. The prototype will also differ from original proposals having, since a decision announced in March, a single turbofan and hybrid electric propulsion from Bye Aerospace in place of two turboshafts. As before, there are three, five-blade ducted fans: two in the wing leading edges, swiveling through 90 deg. between hovering and forward propulsion (when wings provide lift); and one fixed and thrusting vertically in the rear fuselage, employed only during takeoff and landing. Control is fly-by-wire, while carbon fiber and epoxy feature prominently in the structure. 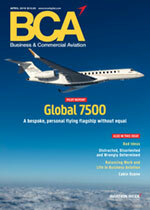 How Does Gulfstream Retain It's Lead In Business Aviation?